Russian and French representatives have signed an agreement on building two navy ships that will be Russia’s first major weapons purchase since WWII. ­Russian Deputy Prime Minister Igor Sechin and French Defense Minister Alain Juppe signed the deal at a shipyard in the city of Saint-Nazaire on Tueday. French President Nicolas Sarkozy was present at the ceremony. 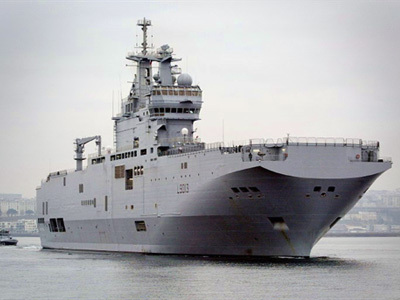 According to the contract, France will build and supply to Russia two helicopter carriers of Mistral class. Russian delegation visited the shipyard and examined a similar ship that is currently being built there for the French Navy. Russia was in talks on the purchase of the helicopter carriers since 2009. The sides came to an agreement in December. According to the arrangement, France will supply two ships to Russia on the first stage and build two more ships later. The price of the deal was not disclosed, but analysts estimate the price of four ships at about 1.5 billion euros. 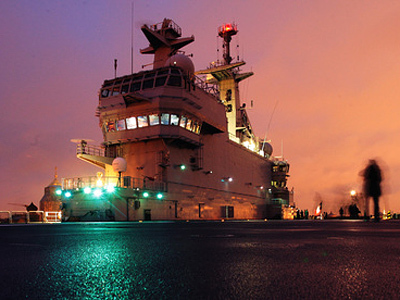 The Mistral class ship is capable of delivering a marine group to a scene of military operations and providing aircraft support there for an extended period. The ship can carry up to 16 helicopters, 40 tanks and 450 soldiers. The Russia-France deal has drawn some flak from other countries, first of all from Georgia. Georgia, with its long Black Sea coast, fears that the possession of the newest amphibious ships will give Russia even greater ability to protect its allies Abkhazia and South Ossetia – two independent states that the Georgian administration seeks to return to its own control. The Georgian move has enjoyed some support in the US Senate. Six Republican senators, headed by John McCain, sent a letter to France’s ambassador in Washington in which they said that the Mistral deal is a sign of approval of Russia’s “aggressive” foreign policy, and thus should be prevented. On the day before the contract was signed, the Georgians reiterated their objections and said that the deal posed threats. Despite foreign protests, French authorities, including Prime Minister François Fillon, praised the deal which they saw as an example of growing co-operation between Russia and NATO and a large input into the European stability. NATO also said it was not against the deal. “We take it for granted that this trade arrangement will take place in full accordance with all international rules and regulations. And we also take it for granted that Russia will not in any way use this military equipment against any NATO ally, or any neighbor,” NATO’s Secretary General Anders Fogh Rasmussen has said. The Russian side also said that all fears of possible aggression were groundless. Deputy Prime Minister Igor Sechin said after the signing ceremony that the project was not aimed against anyone. “We have a calm reaction to the criticism. First, we would like it to be objective, of course. But apparently it happens due to lack of information. The realization of this project is not aimed against any separate countries. It is not aimed against anyone at all. 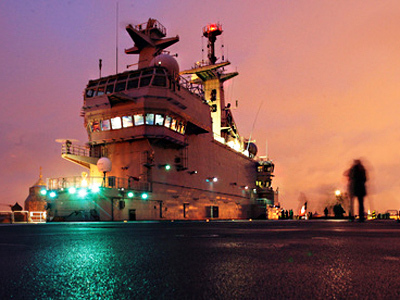 It is simply aimed at meeting the demands of our navy,” Sechin told reporters in Saint Nazaire. “We are ready to tell all how we plan to use these ships. The navy is not making a big secret of it,” the official added.